The passenger transport sector accounted for 12% of Japan’s CO2 emissions in 2010. Two Deep Decarbonization Pathways are structured to investigate the way in which different technical and social transformations can reduce the transport-related energy use and GHG emissions. An advanced technological (AdvancedTech) scenario focuses mainly on the technological innovations and transformations in the transport and energy sector, but does not give consideration to social and behavioural factors. On the other hand, the balanced scenario is structured with the objective of developing a long-term strategy to achieve a drastic GHG emission reduction in transport sector by means of a balanced behavioural and technological changes. The passenger transport sector accounted for 12% of Japan’s CO2 emissions in 2010, which is known as one of the main cause of global warming. Transport-related energy use and emissions could increase at a faster rate than emissions from the energy end-use sectors without the implementation of aggressive and sustained policy interventions. Because the continuing growth in traffic activities could outweigh all mitigation measures unless transport emissions can be strongly decoupled from GDP growth, it will be challenging to reduce the passenger transport-related emissions to achieve the goal of deep decarbonization in Japan. 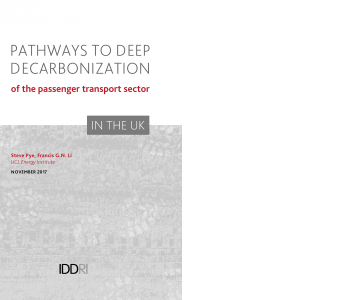 Two Deep Decarbonization Pathways Project (DDPP) scenarios are structured to investigate the way in which different technical and social transformations can reduce the transport-related energy use and GHG emissions. An advanced technological (AdvancedTech) scenario focuses mainly on the technological innovations and transformations in the transport and energy sector, but does not give consideration to social and behavioural factors. The GHG emission reduction target under continued economic growth is achieved by large-scale energy demand reduction by end users and decarbonization of power generation. On the other hand, the balanced scenario is structured with the objective of developing a long-term strategy to achieve a drastic GHG emission reduction in transport sector by means of a balanced behavioural and technological changes. Compared with the focus of technological development in the AdvancedTech scenario, the balanced scenario is aimed to explore the maximum reduction potential of GHG emissions from an integrated and combined perspective of both technological innovation and social transformations. In the AdvancedTech scenario, although the average annual distance travelled per capita increases during 2010 to 2050, the average individual emissions from passenger transport decrease over this period, thanks to the improvement of energy efficiency and emissions intensity. The large electrification in transport sector is the main contributor of emission reduction, followed by the strong decarbonization in the power generation sector through a massive deployment of CCS and renewable energies. The share of renewable energies and CCS-equipped plants reaches high proportions of total electricity generation, thus the GHG emissions in transport sector can be largely reduced by the shift to low-carbon electricity. In the balanced scenario, the emission trajectory shows much lower values than those of the AdvancedTech scenario, thanks to the decreasing individual mobility and modal shift from carbon-intensive modes towards low-carbon modes of transport. Social and behavioural changes in demography, urban structures, land use, lifestyle, infrastructure can effectively contribute to further reduce the GHG emissions above the technological transformations. A roadmap for moving to a deep decarbonized transport sector is presented by combining low-carbon policy initiatives and measures in consideration of both technological and social transformations such as environmentally-friendly vehicle technologies, CCS-equipped power plants, compact city, mixed and intensified land use, transit-oriented development, pedestrian-friendly street design, lifestyle change, and so forth. In order to alleviate the risks that the deep decarbonization pathway fails and the targets are not achieved as planned, it is necessary to consider which policies are the first priorities for the near future. Since the deep electrification and CCS deployment cannot be achieved in the short-term, the efficiency improvements in conventional internal combustion engine-driven vehicles and aircraft deserve more attentions in the near-term. Social transformations such as low-carbon urban reorganization, teleworking, online shopping also can be effective within a short period. A key challenge for transport policy in the UK is the Government’s own domestic climate legislation, which mandates “at least” an 80% reduction in greenhouse gas (GHG) emissions relative to 1990 levels by 2050. Past analysis reveals that achieving this target translates into a requirement for the carbon intensity of transport to decline by around 70% on average by 2050. 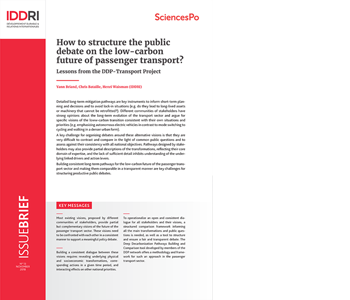 We describe two new scenarios that provide distinctive visions of how passenger transport could evolve in the future, driven by rapid technological progress, changes to societal mobility trends, and the requirement to transition towards low or net-zero energy systems. Both of the scenarios presented achieve similar levels of decarbonisation by 2050, but take very different pathways towards that destination. Travel by private passenger car is the dominant travel mode of choice for UK residents. Cars currently provide more than 80% of all travel needs, with approximately one car for every two people living in the country. While the growth of cars on the road and social trends linked to car ownership has been very rapid since the 1950s, there are some indicators that suggest demand for travel by car might have recently decoupled from population and economic growth. Whether or not history will reveal the current plateau in demand growth as a temporary interlude or a turning point in mobility trends remains to be seen. It is an open question for policymakers and one that has critical implications in terms of investment, regulation, and the future strategic planning of national infrastructure. A key challenge for transport policy in the UK is the Government’s own domestic climate legislation, which mandates “at least” an 80% reduction in greenhouse gas (GHG) emissions relative to 1990 levels by 2050. Accounting for various demographic, economic, and technological trends as well as the pattern of demand across different sectors, past analysis reveals that achieving this target translates into a requirement for the carbon intensity of transport to decline by around 70% on average by 2050. This implies a need for radical solutions over the next 20-30 years in order to achieve the kind of structural changes in the energy system that can meet the goal of deep decarbonisation. The analysis presented in this report is intended to support engagement with transport experts and decision makers regarding actionable policies towards transport emissions reductions in the UK context. Rather than pursuing a narrow focus on technological solutions alone, the analysis explicitly seeks to uncover and explore other important determinants of transport demand and emissions such as changes to demographic and economic structure, urban planning, culture, lifestyles and values. This is because past research and engagement with energy system stakeholders in the UK shows clearly that experts view the social dimension of energy use to be at least as important as technological change. Freedom to Roam (F2R): a future where new communication and transport technologies reinforce existing societal tendencies towards maximizing individual comfort, convenience and autonomy, and economic activity remains concentrated in existing centres of power. No Place Like Home (NPLH): a future characterized by a focus on localism, where new technologies are harnessed for the purposes of strengthening communities, facilitating the sharing of pooled resources and assets, and for diversifying regional economic activities so that multi-polar centres of education, leisure and commerce emerge across the country. These two scenarios embody quite different visions of the passenger transport future. F2R is very much supply side focused with patterns of mobility demand remaining similar to those seen today, rooted in the development of new technologies, notably autonomous vehicles, that strengthen the motivation for car use, due to convenience and meeting the demands of mobile lifestyles. NPLH, on the other hand, sees technology development shift mobility trends in another direction, towards a sharing services model that is also built around greater use of other modes of transport, particularly in metropolitan areas. For both scenarios, a shift to electro-mobility is key to keeping emissions reductions in line with climate policy targets. This underscores the importance of UK action to ensure that a zero-carbon electricity supply is achieved in the 2030s. For mobility transitions to develop in the direction of the future imagined in the F2R scenario, an essential precondition would be the successful early development of highly autonomous vehicles (i.e. SAE J3016 Levels 4 and 5). Mobility transitions in the direction of the NPLH scenario may require government to take a more active role in regional spatial planning. Finally, both scenarios arrive in 2050 with the transport sector emissions being dominated almost entirely by international aviation emissions. Achieving currently legislated national targets for 2050 requires that further options in both energy supply and demand will need to be explored if the UK is to move towards a net-zero emissions position in line with the Paris Agreement in the second half of the century. The transport sector is the main emitting sector and represented about 26% of total French GHG emissions in 2010. 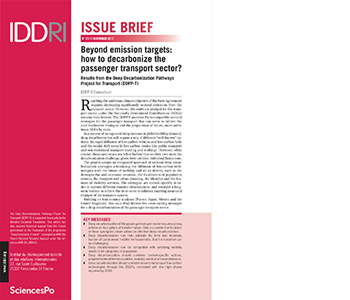 The French DDP team chose to develop two scenarios for the passenger transport sector consistent with the 2°C target and the SNBC objectives, reaching both a reduction of about 78% of CO2 emissions compared to 1990, down to about 20 MtCO2 in 2050. These two deep decarbonization pathways embody contrasting futures of the mobility demand, as well as the supply-side solutions that will be necessary. In November 2015, France has adopted its first national climate mitigation strategy (SNBC), according to the Paris Agreement, to reduce greenhouse gas (GHG) emissions by 75% by 2050 compared to 1990. This strategy sets up three emission budgets for 2013-2018, 2018-2023 and 2023-2028 with sectoral targets. The transport sectoral target to be achieved for the third budget compared to 2013 is a reduction target of 29%, but target estimates for 2050 go well below down to about 70-90%1, which means the transport sector is expected to achieve a deep decarbonization by 2050. The transport sector is the main emitting sector and represented about 26% of total French GHG emissions in 2010. In our previous exercise, we developed deep decarbonization pathways for the whole national economy. However, this previous exercise did not allow enough granularity to understand the determinants of mobility and inform on key transformations of the transport sector. The exercise was mainly focused on the decarbonization of energy carriers with related energy-indicators, which are not sufficient to describe the evolution of the transport sector. During this new phase, the Deep Decarbonization Pathways Project – Transport group defined and used a common methodology to analyze and develop consistent scenarios for the transport sector with transport-specific indicators like distance travelled by trip purpose, by location of people, by mode or budget and time dedicated to transport. Based on this methodology, the French research team chose to develop two scenarios for the passenger transport sector consistent with the 2°C target and the SNBC objectives, reaching both a reduction of about 78% of CO2 emissions compared to 1990, down to about 20 MtCO2 in 2050. These two deep decarbonization pathways embody contrasting futures of the mobility demand, as well as the supply-side solutions that will be necessary. The Mobility-First scenario (MOB-F) emphasizes social, organizational and technical transformations of the mobility system “first” and then shows how technological innovations contribute to the decarbonization of this new mobility system. MOB-F scenario integrates a demand decreasing effect linked to population aging, the development of tele-activities and structural changes in terms of urban and transport planning in suburban areas oriented towards the development of better public transport and soft mode services. Conversely, the Technology-First (TECH-F) scenario takes into account the current mobility trends describing an increasing demand and does not anticipate fundamental changes in the mobility system. Therefore, it emphasizes technological innovations “first” and considers that low carbon technologies will provide an adequate solution for attaining climate mitigation objectives with an additional improvement of technological efficiency, the penetration of gas-powered cars and an extensive generation potential of liquid and gaseous biofuels. The MOB-F and TECH-F scenarios have been inspired by the strategies developed for the National Debate on Energy Transition in 2012, respectively by EFF- and DIV-strategies. We provide in the following some details about concrete transformations occurring in our scenarios. The average constrained distance travelled could be reduced in both scenarios by 6 – 27% compared to 2010 level, due to specific incentives on the organization of living places, the development of ICTs, the level of modal services and a structural aging effect. The modal share of cars could be reduced by 36% and the share of public transport and soft modes be increased by 42% in metropolitan areas in the MOB-F scenario due to specific incentives on modal speeds, modal costs and the level of services. The development of electric vehicles could represent about 57-63% of new sales by 2050 and CO2 intensity of new cars could be reduced down to 21-35 “well-to-wheel” gCO2 per vehicle-kilometer by 2050. To avoid lock-in situations, policy-makers must track the ongoing transformations by using key quantitative indicators to inform on the policy implications. This dynamic form of management should support the selection at the right moment of the “policies that preserve future freedom of choice, yielding high option-value”2. For this purpose, we need refined indicators to track the evolution of the transformations of the main determinants of mobility and related emissions drivers as proposed in the “Standardized DDPP-Transport graphics” in annex. The debate about the decarbonization of the passenger transport sector should focus on the future organization of living spaces and on mobility functions for people beyond being a pure technological debate, even if low carbon technologies are very important for the sector’s decarbonization. National actions for deep decarbonization of the passenger transport sector should combine different strategies adapted to the different regions and urban contexts, the purpose of mobility and distances related to different systems of mobility. In addition, a number of key questions emerged from this work: both scenarios integrate a high share of electric cars by 2050 and bring many questions around the development needs for charging points and related power generation and distribution infrastructures; The implementation of teleworking could concern more than 7 million workers but how to ensure this implementation; The transformations of suburban zones require significant reforms regarding land use, urban and transport policies; Other key technological issues emerged such as what should be the place for biofuels, the place for air travel, the development of autonomous vehicles; What is the place of fossil fuels by 2050 in the car mobility and air mobility, etc. In the perspective of a “carbon neutral” economy, the passenger transport sector could be an important contributor to emissions reduction. A pathway combining MOB-F and TECH-F mitigation options could lead to a deeper decarbonized future. However, all measures and transformations considered are not independent and the development of an appropriate scenario for carbon neutrality would need further analysis to test the consistency of all assumptions based on the DDPP methodology. Current and historical patterns of uncontrolled urbanization and poor public transportation strongly encourage the use of private vehicles with an ever-lower occupancy rate in increasingly congested roads. The increasing surface of cities effectively expands the distances commuters need to travel everyday. The resulting rise in gasoline consumption has exceeded domestic refining capacity and imports account for half of total supply. The transport sector is the single largest source of GHG emissions in Mexico with a fourth of the total. Two scenarios are presented, both leading to a 50% reduction in annual CO2 emissions of the passenger transport sector by 2050 (50 MtCO2) compared to the level in 2010. This study uses a common developed methodology to explore passenger transport low carbon futures to 2050, consistent with 2°C global scenarios. The present analysis takes account of previous work1 which explored transport dynamics according to the projected growth of cities and which refined vehicle fleet size estimates. A further level of granularity is added by distinguishing between travel demand due to Non-Constrained activities as opposed to Constrained travel. The former relates to occasional activities that might imply longer distances per trip, typically holidays, weekend recreation or family visits. In the category Constrained, we include all travel demand related to daily activities such as going to a job, a school, or a supermarket. New analysis reveals high demand for long-distance travel, previously only partially considered. Roughly a fourth of long-distance travel is due to work-related activities, which was already considered in previous mobility demand estimates. However, long-distance travel due to non-constrained mobility (such as international aviation and domestic intercity buses), as well as non-motorized travel, have now been included in overall mobility demand estimates. The analysis contained herein presents an initial exploration of the solution space. As such, it does not present “best” or “recommended” trajectories of change, but potential trajectories established on simple assumptions (which are subject to review and refinement) with the intention to enable the discussion of what might be required to deeply decarbonize passenger transportation in Mexico by mid-century. The Deep Decarbonization work of 20152 is used as the framework within which the overall Mexico target sectorial breakdown is determined, as well as the macroeconomic and social development assumptions driving future activity and emissions. Two scenarios are presented, both leading to a 50% reduction in annual CO2 emissions of the passenger transport sector by 2050 (50 MtCO2) compared to the level in 2010. The Demand Scenario is the one in which the broadest range of levers is acted upon. Here a 10% reduction in constrained mobility by 2050 is projected as the result of a better urban design, a more dynamic and developed society, and of the partial adoption of home-based activities (working and shopping). In highly urbanized areas commuters shift from cars to a multimodal system integrating metro lines, lightweight and suburban trains, and buses. From these, 40% are electric and 20% operate under high-occupancy BRT schemes. In smaller cities areas, the presently short distances travelled daily could triple by 2050, so car use increase is partially restrained by the development of an intermodal network of buses and trains. For non-constrained trips car and bus use is kept at today’s levels and intercity trains satisfy the emerging demand. Domestic air travel is also partially substituted by train, particularly over medium distances (500-800 km). Metropolitan areas are connected through high-speed trains. Internal combustion engine cars are 60% more efficient by 2050, and electric cars reach 23 million by 2050 (45% of the fleet). All new railroad infrastructure is 100% electric. The Demand Scenario results in 17% lower overall energy consumption for passenger transportation in 2050 compared to 2010, and energy carriers satisfy more than double today’s transport demand with nearly half the carbon footprint. The annual demand for fossil fuels is halved over that period virtually eliminating the need for imports. The Technological Scenario explores what would be needed to reach the same end-year emissions as in the Demand Scenario, assuming no demand reduction from changes in urban organization or the behavior of commuters. In this scenario a more marked modal shift is required to reduce car use and meet the emissions target. The total demand for train travel is 21% higher than in the first scenario, and an additional 10% of the bus fleet is electric. Energy consumption in this scenario is 3.9% higher than in the Demand one. The average person would travel longer distances, bringing up average mobility costs by 1.5% and metropolitan daily time required for travel increases by 10% in comparison to the Demand Scenario. The levers modeled in this study represent important changes unlikely to occur under an incremental extension of existing policy packages and frameworks, but rather require an in-depth re-visiting of the relevant policy space. Structural change will be essential. Efficient achievement of such change will necessitate decisive early action to shift trends and commence decades-long changes in investment and behavior patterns. In practical terms, radical shifts in urban, fuel, energy, and transport programs must commence pre-2020. Delay until 2030 would imply far steeper gradients than those presented here, bringing into question the credibility of such a change program. This has implications for the formulation of the Long Term strategies of Article 4.19 of the Paris Agreement, and indeed for the NDC update process, both of which would be strengthened by presenting Passenger Transportation actions in frameworks similar or translatable to those utilized in this study. Development of low-income sectors of the population should entail an increased access to mobility services at affordable prices, while avoiding inefficient past patterns. Closing the income gap would increase people’s ability to adapt to new low-carbon urban paradigms. Mobility can be more efficient if the design of cities helps reduce the distances travelled every day. High-density, mixed land use neighborhoods designed for non-motorized travel provide good conditions for the development of mass transport systems, reducing the amount of energy and cost required to transport each person. Unless the daily use of cars is limited, other decarbonization measures, such as electrification or the increase in vehicle mileage, will do little to reduce CO2 emissions and energy expenditure. The transformations implied are of very large scale and will require inter-sectorial and inter-level coordination between government branches. Early inclusion of the academia and the private sector in planning and execution is essential to draw upon their economic and technical resources. Significant further research is still needed to improve data quality, forecasts, and assumptions, to strengthen and refine the conceptual framework, and to extend the scenario analysis and the granularity and causality of levers, so specific policies can be derived from them.